After an afternoon of pondering this conundrum, I have come to at least one conclusion: there can not only be one. I actually felt sick at the thought of picking one above another, feeling that they would be disappointed in me, despite the fact that, um, they’re all dead. So I have been very courageous and narrowed it down to five, but amongst those five, I will never choose. In order to waste even more time I decided to do a little bit of research about my homeboy’s, because after all, there is a person behind a book (or so I’m told). I am listing these authors in alphabetical order by last name, purely so there is no arguing or jealousy amongst them. I may need to get out of the house. 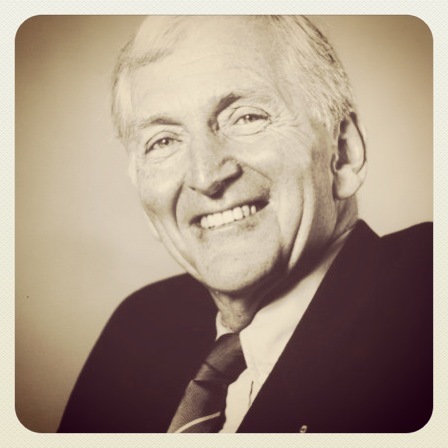 I cried when Bryce Courtenay died. I remember it distinctly, because my mum called me to tell me, and I didn’t believe her at first. I had to check the internet to confirm it. Bryce, you old devil, you got me good with that one. I am tearing up just writing it here. Anyway, on to brighter things. I am starting to realise that I will natter on all day if I don’t give myself some strict guidelines, so I’ll make them up as I go along. He wrote his first story when he was seven, about the man in the moon, called The Moon is Black. He came to Australia because he was banned from his home country of South Africa, for starting a weekend school for African’s. He is responsible for creating one of Australia’s most famous adverts, The Milkybar Kid. He didn’t begin writing The Power of One, his first novel, until he was 53. Since then he has published 21 books in 23 years. He gave away on average 2500 book a year, to reader’s he met in the street. In the STREET. Why the heck don’t I live in Sydney. Besides love, independence of thought is the greatest gift an adult can give a child. Always listen to yourself…it is better to be wrong than simply to follow convention. My blog post about Courtenay’s book April Fool’s Day can be found here. 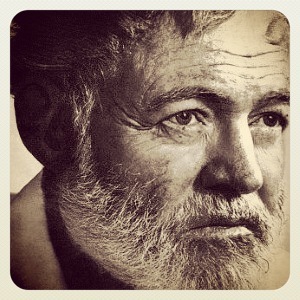 As with a lot of the most famous classicists, I was intimidated initially by Hemingway. I was worried that I would find his writing too dense and confusing, a throwback to a different literary time. I bought To Have and Have Not about 10 years ago, where it sat on my shelf looking grand but gathering dust. About a year after I bought it I decided to give it a crack, and thus began my love affair with this amazing man. As a young child, his mother used to dress him in girl’s clothes. He was an ambulance driver for the Red Cross in WWI. The FBI maintained an open file on Hemingway from WWII onwards. Upon waking he would drink absinthe, whisky, vodka, wine, gin, tequila, champagne and beer. Seriously. The man invented the mojito. I could bow down and kiss his feet for bringing this summertime dream into the world. My post about Hemingway’s Men Without Women can be found here. Like 9/10ths of the rest of society, I was introduced to Animal Farm in Year 9 English. We pulled that poor book apart so aggressively to find ‘meaning’, that by the end there was no meaning left. I associated it so heavily with the scent of frustration and boredom in 4th period English that I didn’t read it again for about six years, despite having it in my possession the whole time. Then, late one night, I smoked a little Mary-Jane, settled down with the book, and subsequently had my mind blown. He was born in India but moved to England when he was one. His father worked for the opium department. He wrote the majority of 1984 in 1948. When Animal Farm was released, Orwell travelled from bookshop to bookshop moving it from the children’s section to the adult’s. The fact that he lived in abject poverty in both London and Paris, despite the fact that he could have sought help from his parents at any time, shows the immense depth of character this man truly has. 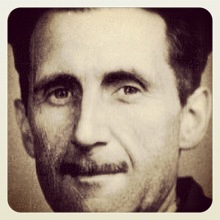 My post about Orwell’s Down and Out in Paris and London can be found here. I don’t know what happened when I first read The Grapes of Wrath. Something in my brain clicked into place, locked onto Steinbeck’s writing, and refused to let go. I simply adore the writing of this man, it is poetic and musical in ways that I can only dream of achieving. Since reading The Grapes of Wrath I have determinedly sourced Steinbeck’s books in any way possible, including stealing Of Mice and Men off my little brother. So crazed am I about Steinbeck that I actually own three copies of East of Eden…and I don’t care. 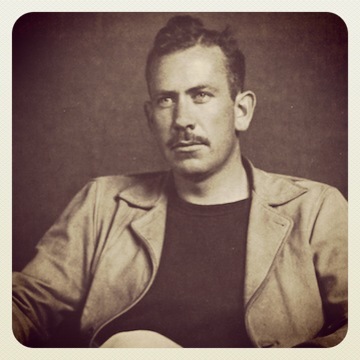 His actual family name was Großsteinbeck, which his grandfather shortened to Steinbeck upon immigrating to America. He dropped out of Stanford University before graduating to become a writer. He was one of the first Westerner’s to visit the USSR after the Communist Revolution. After JFK was assassinated, Jackie Kennedy approached Steinbeck to write the official biography of the late president. Steinbeck has his own museum, The National Steinbeck Centre, in Salinas California. It is the only museum in America to be dedicated solely to one writer. Steinbeck shunned the limelight, despite gaining fame at a relatively young age. If I had the ability to write anything even an eighth as beautiful as The Grapes of Wrath you would be hearing about it, from me. Continually. Steinbeck wrote because he needed to write, not to seek fame but perhaps to seek some justice for the downtrodden he continually championed. If you’re in trouble, or hurt or need – go to the poor people. They’re the only ones that will help – the only ones. My post about Steinbeck’s Cannery Row can be found here. Ok. So I lied. I couldn’t pick just five, my fingers couldn’t even type the words. I am at a complete standstill in choosing between Oscar Wilde and F. Scott Fitzgerald, so whatever. They are equal favourites in my mind. I am not going to write about them in this post because my neck is getting sore, I have spent roughly two hours longer than I first expected delving into the lives of these wonderful men, and I’m sure you have had enough. Also, it leaves me room to write a new post about them, which means I can include my Highly Commended’s, Lewis Carroll and Ben Elton. Hopefully no one has notice that my ‘five’ favourite authors has rapidly become eight, and will undoubtedly be more by tomorrow morning. I make no apologies. I just love these guys. I am slightly embarrassed to point out something else. Something I’m sure you have realised. All of my favourite author’s are men. Yep, every one of them. I don’t know why this is. I certainly don’t believe that men are better writer’s than women, I own and adore many books written by female authors. I would like to be a female author myself. I didn’t actually realise that all my favourite author’s are male until I sat down and came up with this list, but now I guess the truth is out there. Please don’t think poorly of me. These boys are simply my homeboy’s. I would like to end by imagining these four men in a bar somewhere, a small-town, broken-down hole in the wall. There is cobwebs on the windows and decades of spilt drinks staining the bar wood a deep scotch brown. They would all be swilling their drink of choice, Hemingway dominating the conversation in a booming voice as he waves his mojito and calls for another round. Courtenay would be throwing back beer with the best of them, sharp as a tack amongst these literary heavyweights. His quick wit and even quicker quips would have them all in stitches, Steinbeck smiling quietly to himself as he sips on his ‘Jack Rose’. He is taking in the scene with watchful eyes, perhaps writing it into some as yet unknown masterpiece about the lives of working men. Orwell would lend a lofty tone to the conversation as it switches from women to politics, putting forth his views with confident ease. His glass of cheap wine sits on the bar, a throwback to days in Paris where wine was the poetry of life. He is waiting until Hemingway is otherwise occupied, then he plans to ask the silent barman for a cup of strong tea. A cloud of smoke hovers above their heads as their cigarettes glide through the air, keeping tempo with the pace of the conversation as each man makes his argument. There is laughter and jeers, mocking and anger as the conversation swirls in the bar like brandy in a balloon. Wilde and Fitzgerald hover outside, sure of their welcome but not wanting to interrupt. Eventually they turn and leave, deciding to come back on a different day. And there we will leave them, my literary hero’s, in an unnamed bar in an unnamed town, drinking as much as they can and smoking without fear of death. They have given their blood to the world in the form of their words, leaving behind legacies that will never fade. This is their time now, their time to take back their pound of flesh and reminisce on their halcyon days as wielders of pen and soldiers of truth. Who are in your top five? I agree that if you love reading it’s impossible to have just one favourite author – or book for that matter. It would be like choosing between children if I had any. I also notice that my favourite author/book tends to change according to what kind of space I’m at in life. And I love Hemingway, Orwell, Scott Fitzgerald and Steinbeck of course. I’m not sure how you couldn’t love these guys – if not for their style and storytelling, then at least for the contribution they made to literature. So true, it is kind of like choosing between your children, nearly impossible. And it does change, just like you say. I narrowed it down to these guys because they are all authors who I have been reading a long time, whose books I seek out (and plan to own them all eventually 🙂 ) and who I can pick up no matter what mood I am in. Thank you for sharing your top 5 (or turn to 8) favorite authors. I never read any books by them despite knowing some of them or thier well known books. Totally with you on the Mojitos. Damn good drink. I really felt like one when I was writing this…..it is a damn good drink! I’m so glad you liked it! Yes that is the beauty of Hemingway isn’t it, he says so much in so few words. Great selection. I have to admit I haven’t read much Baldwin/Williams, and I have never heard of Langston Hughes! So thankyou for a few more great writers to explore. Also my boyfriend’s middle name is Langston, so I love that name, can’t wait to get to know the author. You’ve got me hooked, I’ll be be back for more. Fantastic blog! I’m going to be torn between reading books and reading ABOUT BOOKS on your blog. Thanks for the introduction to Bryce Courtenay; I’ve never heard of him or read any of his books. A new treasure chest to dig into! I hope you like him, he writes a lot of Australian literature. His books are always ridiculously well researched, to the point where you begin to question if it is a true story! A mark of a great writer in my mind. Thanks for stopping by! Very hard to choose just five and my list isn’t necessarily in order. There are countless more. 🙂 But these are my favorites because they are my role models. When I read their work, I think, man I wish I could write something like that! They write with such insight into their readers feelings and emotions and they capture the essence of true life in their details, their characters. What should be mundane and boring is brought to life and made interesting. It’s just amazing. That is a great list! There is a few there that I have never heard of, so now I’m really looking forward to checking them out 🙂 It’s interesting to sit down and really think about who your favourite’s are, isn’t it, because that then leads on to why…and I think you have summed it up perfectly! And, ah yes, the lit crush. Hemingway broke my heart in The Paris Wife. I’m still recovering. I haven’t read The Paris Wife but I just looked it up. Seems like it is a must-read, thanks for the introduction! Thankyou, sometimes I think it is nothing but the ramblings of a half-crazed mind…so I am truly glad you enjoyed it! I meant to add earlier that you hit home run with the “homeboy”. The purrfect word. Enjoyed the Man of Heart post, how you tied in your experiences with the bk. Thankyou 🙂 It actually popped into my head while I was gardening, so I belted inside to write the post before I forgot it! Haha, I love it! Probably won’t be long until we can simply scan or upload our thoughts directly onto a computer, even if we’re nowhere near one! Love how we *share* in the writing process. I am so jealous! When I found out about this museum I immediately decided to put it on my literary bucket list. One day I hope. I really hope you enjoy Courtenay, he really is brilliant in my mind. Thanks for following, I hope your wife wasn’t too annoyed at the interruption! No, I haven’t read that one yet! I will have to get my hands on it ASAP, thanks for the recommendation. I’ve visited george orwells grave… You would love it!! Wow I would love to see it! Blog it if you like and I’ll check it out, you have also just given me a fantastic idea for a blog post…famous authors graves…thankyou! Steinbeck would be in my top 5 too, along with Margaret Atwood, John Irving, Cormac McCarthy, Tim O’Brien, Joyce Carol Oates, Carol Shields…. can I have a top 55? Have you read Working Days, the journals Steinbeck wrote while working on Grapes of Wrath? It’s fascinating. 🙂 I would very much like a top 55 too! No I haven’t read Working Days, thanks for a great recommendation! It sounds fantastic. I’m kind of itching to search online for it now……. Now the question is what do your top author choices say about you? Great post and thanks for the follow! Haha very good question, I’m not sure if I want to guess what my favourite authors say about me! Probably nothing good 🙂 It’s a pleasure to follow your wonderful blog. Pingback: Paperbook Land. | The Paperbook Blog. Something absolutely incredible happened to me today. I am keeping it under wraps until it is confirmed, but in the meantime, here is a hint. For those of you who are relatively new to The Paperbook Blog, you may not have had a chance to peruse my top five favourite authors of all time, otherwise known as my homeboys. This post is the reason for the incredibly exciting thing that happened today, so I thought I would share it with you again. Thanks Jade! Hopefully I’ll be able to share the great news tomorrow, pending a confirmation email 🙂 Thanks for stopping by! Can’t wait for your news. my favorite is Kurt Vonnegut. Hands down. Ahh, shameful to say I have never read any Kurt Vonnegut. I’ll add his name to my list of must reads. Thanks John! Brilliant Jayde! I have spent a thoroughly delightful moment reading this post. And to be clear, I seldom award the “brilliant” adjective… but this time it’s the only one that came up and fit. Pingback: NaNoWriMo, NovNov and A Month of Steinbeck. | The Paperbook Blog. Previous PostThat is a beginning. Next PostThe Newly Conscious Young.